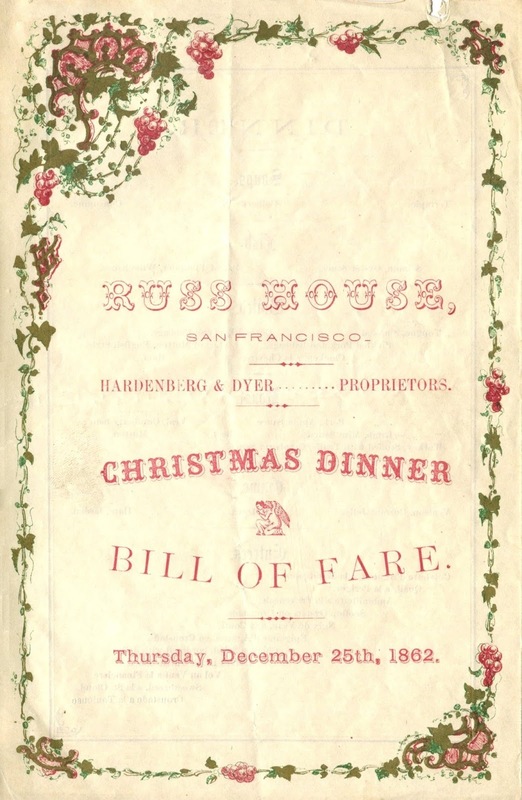 Despite the verdant surroundings, the holiday fare in San Francisco mirrored that in other American cities, as shown by the menu below from the Russ House. Opened on Montgomery Street earlier that year, the three-story Italianate building was a notch below the city’s most luxurious hotels, the Lick and the Occidental. Still, the Russ House was a fine establishment, serving turkey stuffed with truffle, quail à la Perigord, and other fancy dishes for its Christmas dinner. 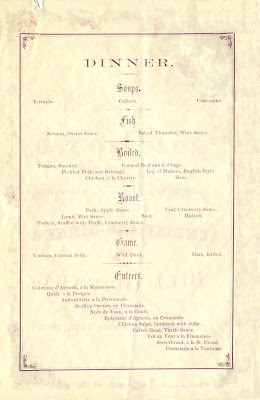 Regional dishes were few and far between on menus in the nineteenth century. What makes this menu distinctive is the wine list on the back offering four varietals and blends from the Sonoma Valley.2 While every effort was made to replicate the growing and wine-making techniques of Europe, these wines were uniquely different, reflecting the climate, soils, and terrain of the region. Interestingly, the price of the local wines is the same, or about the same, as the imported counterparts. 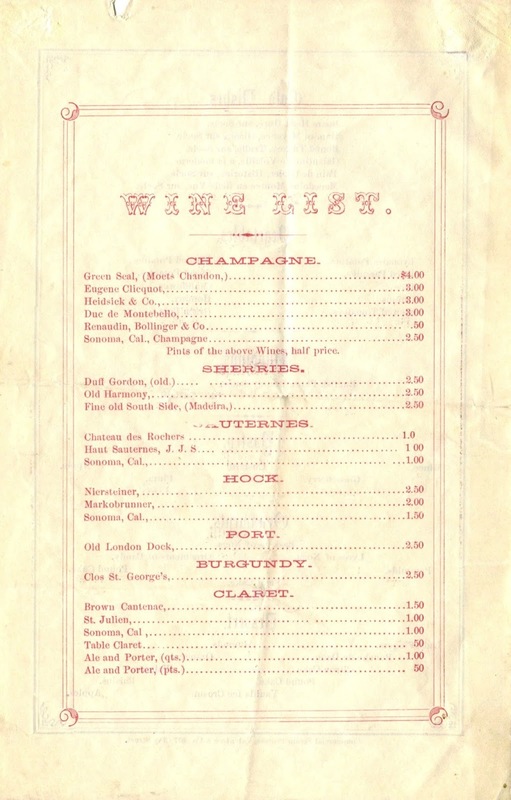 This parity changed in the mid-1860s when the budding wine industry in California vastly expanded production, causing the prices of its products to decline. Three days after Christmas, the city received disturbing news that the Confederate sloop-of-war Alabama captured the California mail steamer Ariel off the coast of Cuba. Before the trans-continental railroad was completed, such events heightened the sense of isolation for those living on the West Coast. In August of that year, the steamer Golden Gate burned and sank near Manzanillo, Mexico. 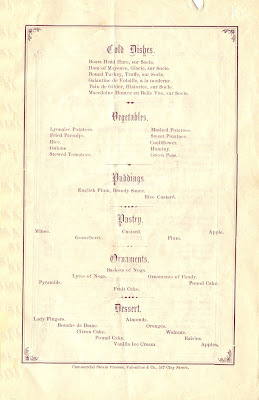 In addition to the loss of over 200 passengers and boxes of gold, the Golden Gate went down with 14,000 letters, some of which may have contained menus—it was customary to occasionally enclose a menu as a way of reassuring the folks back home that you were doing fine in some far-off land. 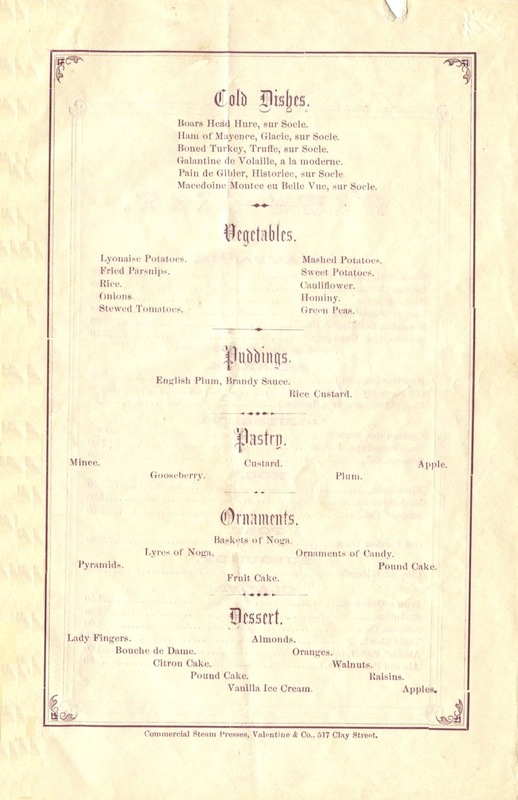 What made menus comforting was that they reflected a universal cuisine that defined one facet of what was considered civilized society. 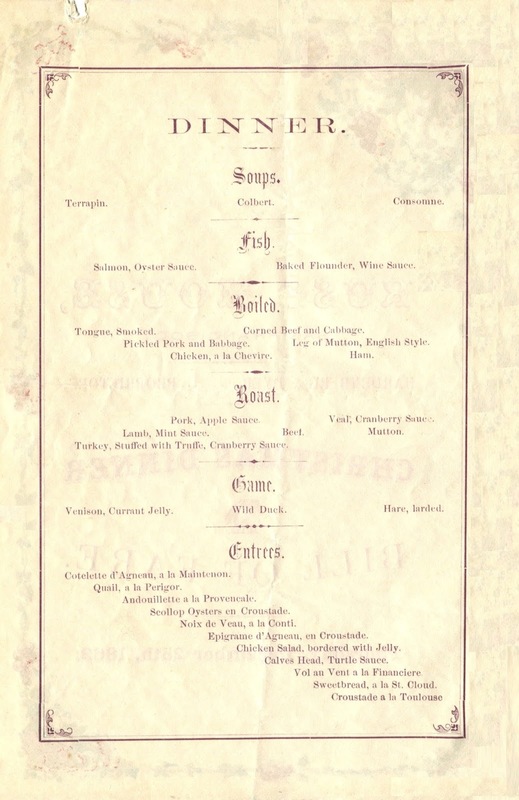 When regional variations finally began to creep onto American menus, it was often in the form of local wines. 2. These wines may have come from the Buena Vista Winery in Sonoma, situated only forty-five miles from the hotel. Founded in 1857, it is considered to be the first major vineyard in California. 3. The Sainsevain Brothers then produced a sparkling wine at the El Aliso vineyard in Los Angeles. 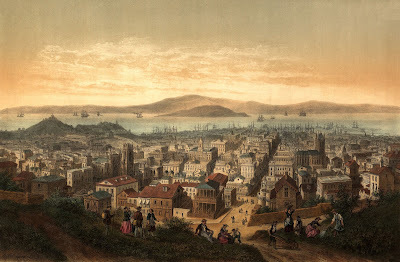 Opening a store in San Francisco in 1857, this winery soon led the state with a production of 125,000 gallons of wine and brandy. 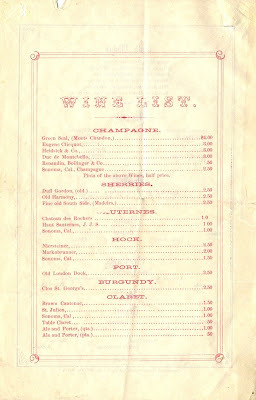 In 1862, the Sainsevain Brothers wine was being advertised at Taylor’s Saloon, a stylish restaurant in New York City.